It hasn’t taken long since David Bowie’s death for a fellow musician to try on the Starman’s boots for size. 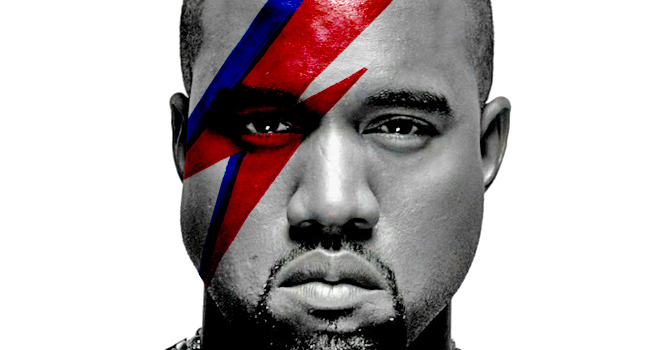 According to the Daily Star, Kanye West is apparently planning an album of of straight cover versions of some of Bowie’s hits as well as original songs featuring samples of the British star’s music. In response, someone has set up a petition to stop West’s project while the Guardian have claimed that, when it comes to paying tribute to Bowie’s five decades of hits, there is “no-one more fitting” than the US rapper. At least pretend to look surprised. Our opinion? The Thin White Duke championed music and musicians from all strata of society, all races and right across the gender and sexuality spectrum. Let the children of Bowie’s revolution pay tribute in any way they wish. And that’s all the children – not just those with access to million-dollar studios and the ears of media execs. The world can honestly get by without another auto-tuned album of chart-friendly melodies and saccharine sentiments, so the challenge to all the wannabe tributes is to create something with feeling. Something with real fire in its belly. Something like this. Bonus video: See Ruby Wednesday take on David Bowie’s Five Years at Virgin Xtravaganzah’s Gods And Monsters night.